The 2006 election for New York's 13th congressional district was won by the Republican incumbent Vito Fossella. Since easily winning a special election in 1997, Fossella had long been reelected without trouble in this district which is based in Staten Island and the southwest section of Brooklyn. At the time Fossella was the only Republican in New York City's Congressional delegation. However, in 2004 Fonsella's share of the vote dropped dramatically against septuagenarian former judge, assemblyman and mayoral candidate Frank Barbaro who achieved 41 percent of the vote. Attorney and former Community Board 10 Chairman, Steve Harrison, the 2006 Democratic candidate, improved on Barbaro's results receiving 43 percent of the vote. ^ Horrigan, Marie (20 October 2006). 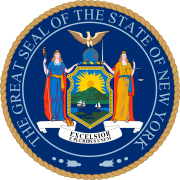 "New York Roundup: Fossella’s Seat Less Secure Than Expected ". The New York Times. Retrieved 15 January 2019. ^ Berman, Russell (8 November 2006). "Fossella and King Beat Back Strong Democratic Challenges". The New York Sun. Retrieved 15 January 2019. This page was last edited on 15 January 2019, at 15:14 (UTC).